When it comes to weather in the Texas Panhandle, only one thing is certain. It'll be hot in the summer. Well, maybe two things are certain; the second being, "Expect the unexpected." 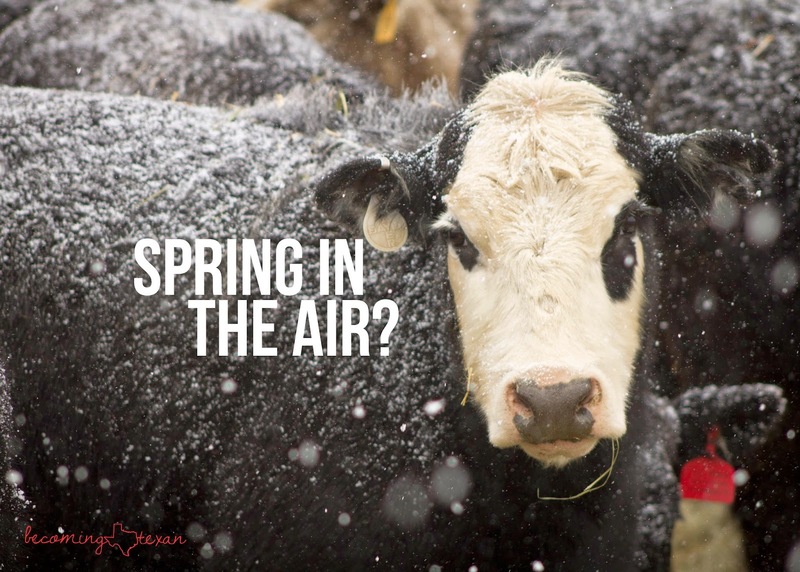 It isn't abnormal for temperatures to bounce around in the spring (or nearly spring). I expect that much. However, with around 70 heifers to calve on the farm in March through May, I (and every other farmer/rancher across the country) really was hoping for cooperative weather. My hopes were not fulfilled. Yesterday, it rained. I love the rain! Rain is a rarity we can't get too much of in the Texas Panhandle so I never want to wish it away. Is it possible to wish for it at a better time though? Because following the rain, we had a cold front push through the region, dropping temperatures well below freezing over the night (read: the perfect time for first-time momma cows to bring their little bundles of joy into the world - not!). This morning I woke up to a frigid windchill and the beginnings of a full-blown blizzard. We didn't get a lot of snow, but it came down sideways, thanks to a hefty northeast wind. Have I mentioned how far from ideal this weather is for calving? Well, it is about as far from as ideal as possible. We had three healthy calves last night. The calves and their mommas are up in the barn with plenty of straw to bed down in. We expect at least one more calf this evening, possibly more. Here's to hoping the others hold off until the weather can straighten out a little. I write this not to complain (because I really do love my first calving season), but to share the struggles we are going through today on our farm. March blizzards are hard on people, but they are so much harder on newborn calves. We do our best to care for them because that's what farming is all about. This is our livelihood, whether rain, sleet, snow or sun (we can hope, right?). These are our animals to tend, and we'll do everything in our power to make sure they are healthy. If you are the praying type, send one up for the ranchers across the U.S. tending their animals in this cold, snowy weather. This is Grumpy Cow. She was not excited about the snow. This is a peachy cow (Charolais X Hereford heifer). She's smack-talking about the weather. Actually, she's just chewing her cud. 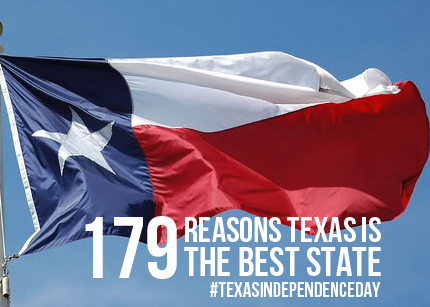 In celebration of Texas Independence Day (from Mexico 179 years ago), I thought it would only be fitting to provide you a list of 179 reasons Texas is the best state in the United States. Texas truly is a gift to the world, just ask any Texan. *Note: Order does not dictate importance. Also, this is far from being a complete list of reasons why Texas is the best state in the U.S.
Six flags have flown over Texas. 7.4% of the U.S. land is in Texas. If Texas was its own nation, it would rank 12th worldwide in GDP. Everyone in the world knows where Texas is at on the map. Most miles of highway = road tripper's paradise. Starry nights are bigger and better in Texas. All of George Strait's exes live here. "That's Right (You're Not From Texas)" by Lyle Lovett - But Texas wants you anyway. *A special thank you to Justin Parker and Royce O'Neal for helping with this list. Y'all are some seriously proud Texans and great examples for me to look up to for Texas knowledge.